Were back in San Francisco. Its sunny and 65 degrees (I just have to mention this for my parents and brothers families sakes in upstate New York, who are now getting their second foot of snow since Christmas). Yesterday, Aaron was taken off the ventilator and put on CPAP. He was put on the nasal CPAP first, which he didnt like too well, apparently. So, they put him on the mask CPAP (see the attached photo; looks comfy, doesnt it?). The mask makes a seal around his entire face, and the CPAP machine maintains a Continuous Positive Airway Pressure. This very low, constant pressure helps keep his lungs inflated, while he does the breathing on his own. This morning, he was at 34% oxygen, which is quite low (and good). Again, the goal is to eventually get him down to 21% oxygen; ambient air is 21% oxygen. From here, Aaron will either regress back to the ventilator, or will progress to a nasal cannula (my spell checker doesnt like my spelling...Mom?). 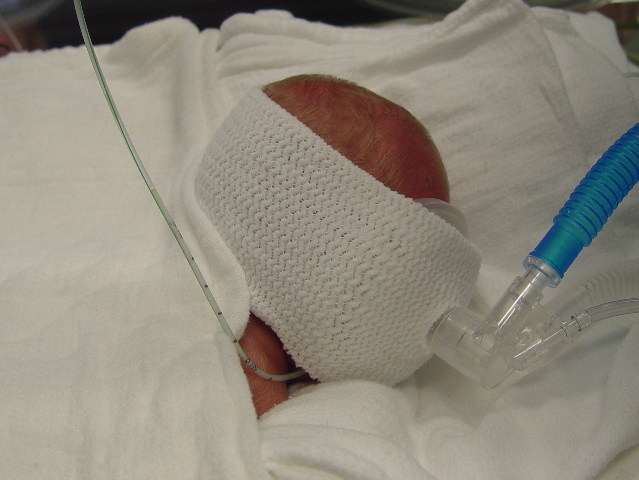 The nasal cannula is simply a plastic tube that would supply oxygen to Aarons nose at ambient air pressure. If Aaron proves himself with the CPAP, well try weaning him off of it, and onto the nasal cannula, for short periods of time, then longer periods of time. Ultimately, the nasal cannula will be removed for good, and hell just breath ambient air on his own, like the rest of us. Todays blood gas tests (hes had a half dozen or so of these over the past 24 hours) have been excellent. So far, he seems to be doing as well on CPAP has he was on the ventilator. This is very good. Its hard to say precisely, but the nurses are guessing that Aaron will probably be on the mask CPAP for a couple of weeks. During that time, we wont be able to see his face, except once per shift (three times every 24 hours) when Aaron will receive his face cleaning (suctioning of fluids, wiping his face, etc.). Kathleen was able to see his face at midnight last night (she was up doing her midnight pumping), but I havent seen it yet. Im hoping to see his face at 6:30 this evening (with camera in hand, of course). Feedings continue to go well. Hes now at 13cc every 2 hours. He weighed in this morning at 1026 grams. Hes been on a diuretic, to help him get rid of extra water, so this 1026 grams (up from 1020 grams yesterday) is very good. Hes off of the diuretic now, so hell probably be putting on weight at a pretty good clip over the next few days. From what little I could see of him today, he looked really good. The baby with serious jaundice that I mentioned a week or so ago is doing much better, and has been transferred to a room for babies that dont need quite as much intensive care. This is very good news. Thank you, those of you who have prayed for this baby and her mom. Aaron has a new next-door neighbor, James, who is a 25-weeker. James story is a bit sad, in that his twin brother did not survive. His mom had to have surgery yesterday for complications from her C-section delivery, so James dad has been by his bedside alone. Kathleen and I have met his dad, and hope to be able to get to know him a little bit and be encouraging to him. Lets continue praying that Aarons little lungs continue to perform well, grow and strengthen. Please pray that Kathleen and my anxiety levels will remain manageable, too. Its a little more nerve-wracking spending time with Aaron this week, since the ventilator is no longer doing his breathing for him. Every time Aarons respiration rate and/or blood oxygenation monitors take dips and start beeping, as they do every three minutes or so, its a little disconcerting for us until he takes a few good, deep breaths and gets things back on track. Sometimes, the nurse has to nudge his body a little bit to remind him to breathe. Ah, life in the NICU! Anyway, thanks for your continued prayers.